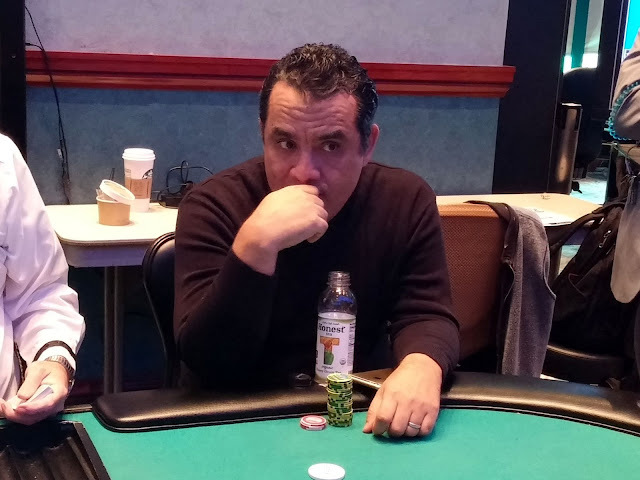 Players in Event #4 $365 Omaha/8 have just returned from their last break of the night. 21 players remain with 12 making the money, and they will play 3 more levels before bagging up for the night. The bubble in Event #3 $580 NLH last two hours. 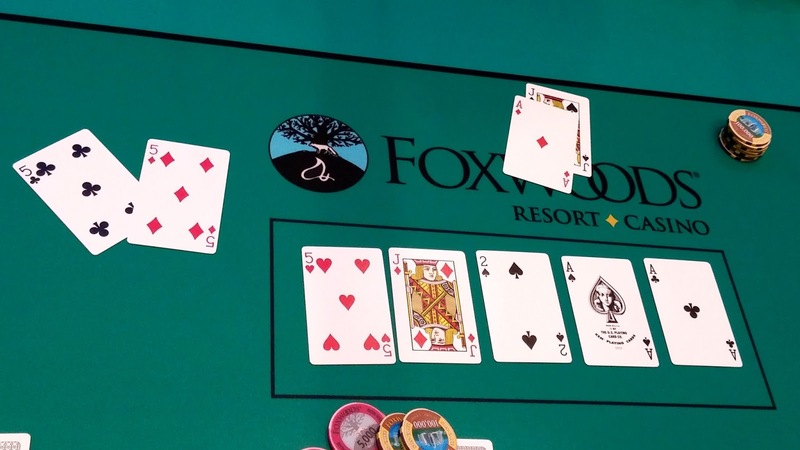 It finally burst when one player moved all in on a jack high flop with K-J and another player called with two pair. 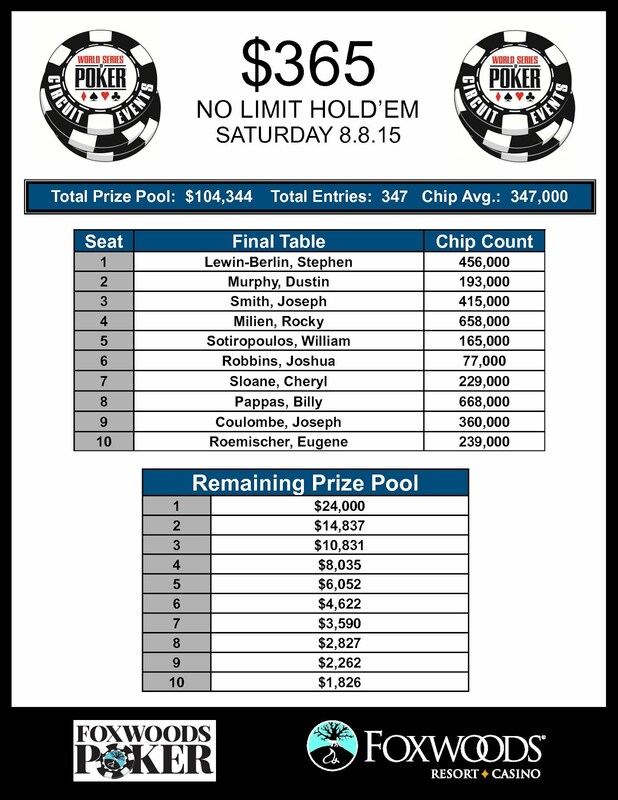 The final 12 are now in the money, and are redrawing for seats at the final two tables. 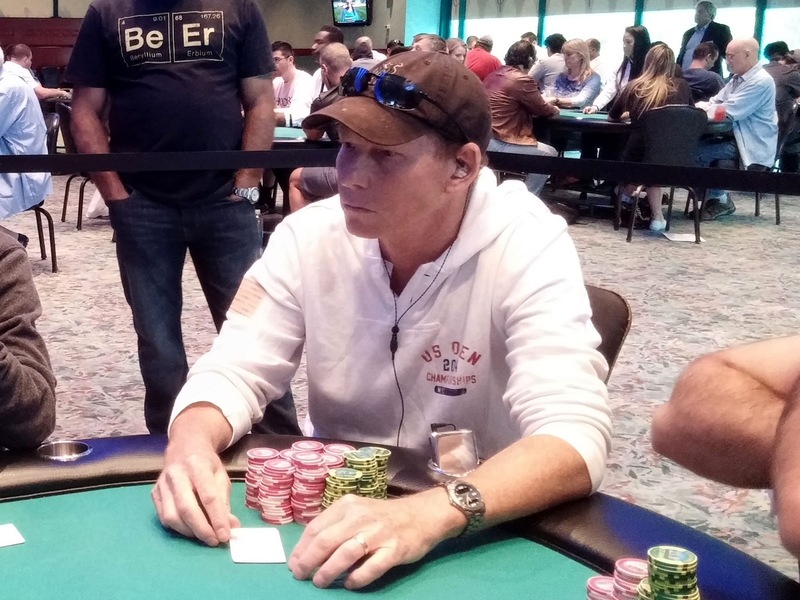 Baruch Thaler is still alive and in the hunt for his third WSOP Circuit ring. You can watch all of the action at www.FoxwoodsLive.com. Joseph Smith was all in perflop holding [Ah][Jd] and was flipping against Billy Pappas's [9s][9c]. The [2s][Th][8s] flop was no help for Joseph, nor was the [2d] turn. Jospeh would need to catch his six outer to survive, but the [5d] meant he would be eliminated in 2nd place, good for $14,837. 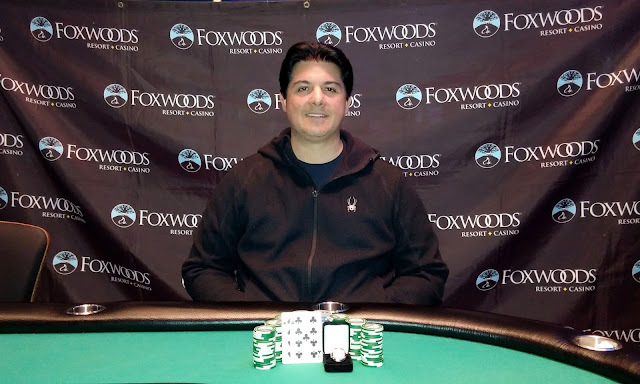 Billy Pappas has won Event #2 $365 NLH, taking home $24,000 along with the title and a World Series of Poker Circuit ring. Congratulations, Billy. 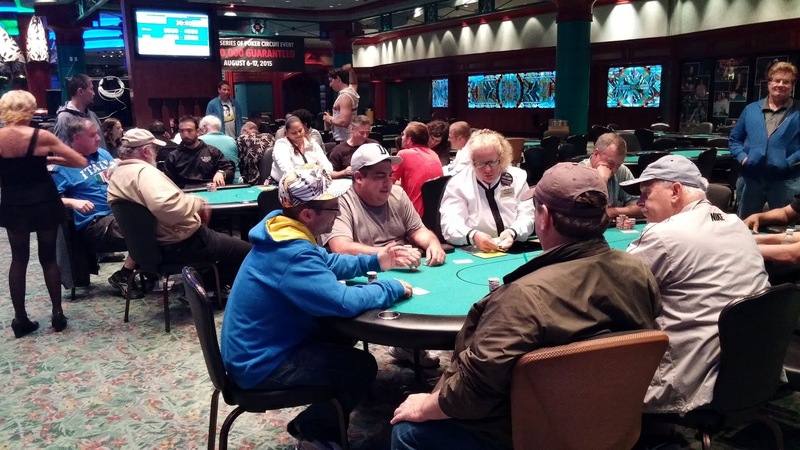 The 23 remaining players in Event #3 $580 NLH Six Max are now on a 1 hour dinner break. Registration for Event #4 Omaha/8 has just closed and we will have payouts shortly. Meanwhile Event #2 is still heads up and looks to be a back and forth battle between the final 2. 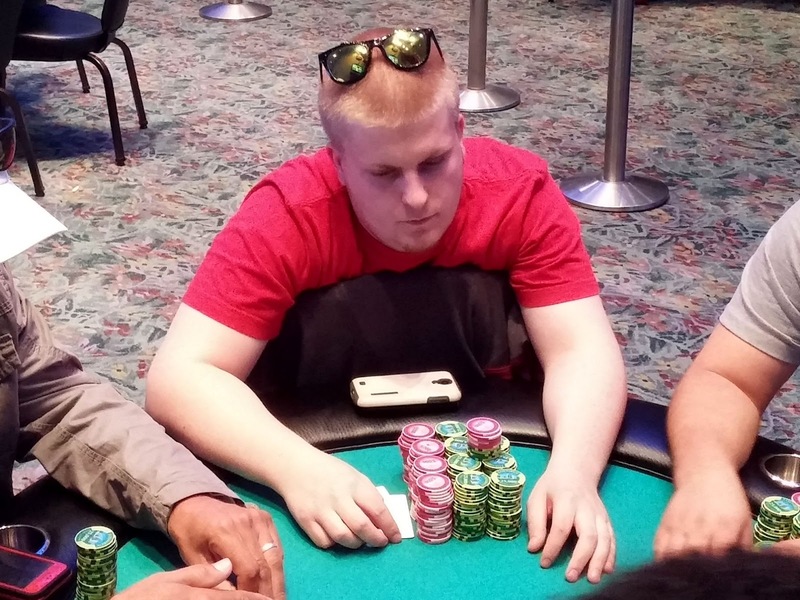 Joseph Undenstock was all in holding [Ad][5h] against Firas Hadded's [Kh][Kc]. The board ran out [3d][6s][5s][8s][4h], keeping Firas's pocket kings in front. He will win Event #1 $580 NLH, earning him $126,760, the title, and the first World Series of Poker Circuit ring of the 2015-2016 season. Congratulations, Firas. 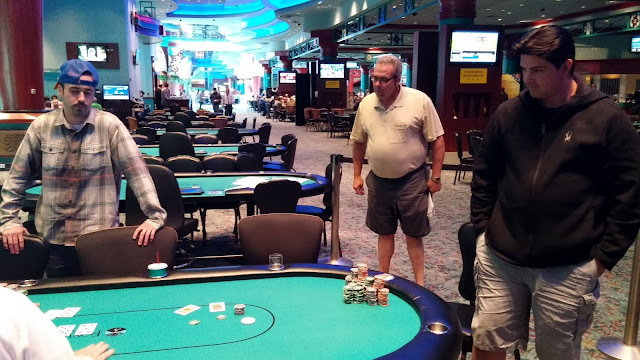 In Event #2, Joseph Smith was all in preflop holding [Ad][8h] but ran into Billy Pappas's [Qh][Qc]. The [3s][8s][5c] gave Joseph some hope, and the [4h] opened some more outs for him. 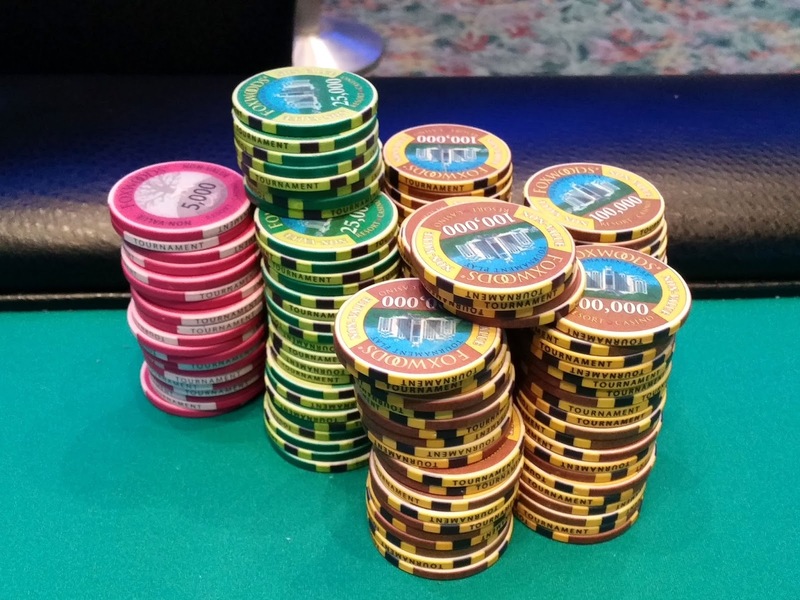 When the [As] hit the river, Joseph made the winning two pair and will double up to around 2,000,000. Billy shrugged off the beat saying, "Back to work." 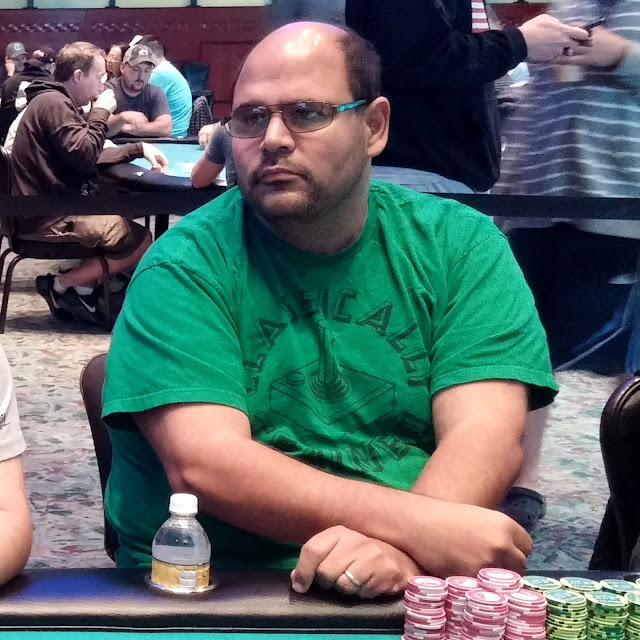 Firas Haddad moved all in from the small blind and Rami Jradeh made the call from the big blind. Firas held [Ad][3c] to Rami's [Ks][Js], but the the [Qd][Kd][9s] gave Rami top pair. Firas would need to catch an ace or running straight cards to survive, and the [Ac] hit the turn to turn the tables. When the [4s] hit the river, the stacks were counted down, and Rami had Firas covered by just 80,000. 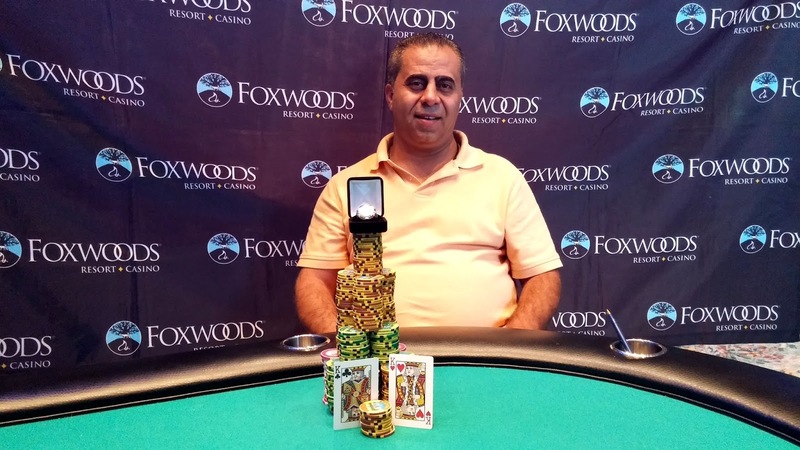 On the very next hand, Firas limped in on the button for 120,000, Rami called all in for less, and Joseph Umdenstock checked his option. Joseph and Firas checked to the river on the a [Ad][3s][Ac][Kd][6d] board. Joseph checked one last time and Firas moved all in, and Joseph snap called. Firas tabled [Ah][Qc] and Joseph flashed a king before mucking. Rami was sent to the rail in 3rd place for $57,624, while Firas doubled up for the second hand in a row, taking over the chip lead. The board read [5h][Jd][2s][As][Ac] and Donald Lohr moved all in. Joseph Umdenstock snap called and said "Full house" showing his [Ad][Js]. It was a brutal beat for Donald, as he also had a full house with his [5d][5c]. Donald will earn $43,808 for his 4th place finish. Walking away from the table, Donald consoled himself as he realized Joseph could never fold top pair on the flop or two pair on the turn. 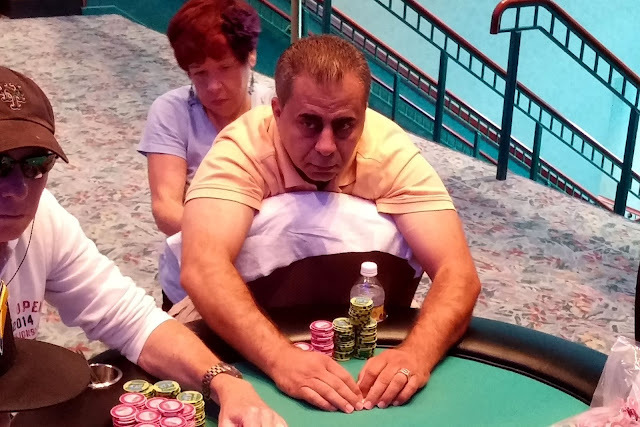 "God is watching out for you"
On a K-9-x-T board with two hearts, Firas Haddad moves all in and Joseph Umdenstock folds. Firas immediately stands up and says, "God is looking out for you" as he reveals his [Qh][Jh]. Earlier, Firas received one of the only walks at this final table and had pocket aces. Firas now sits on around 3,500,000. 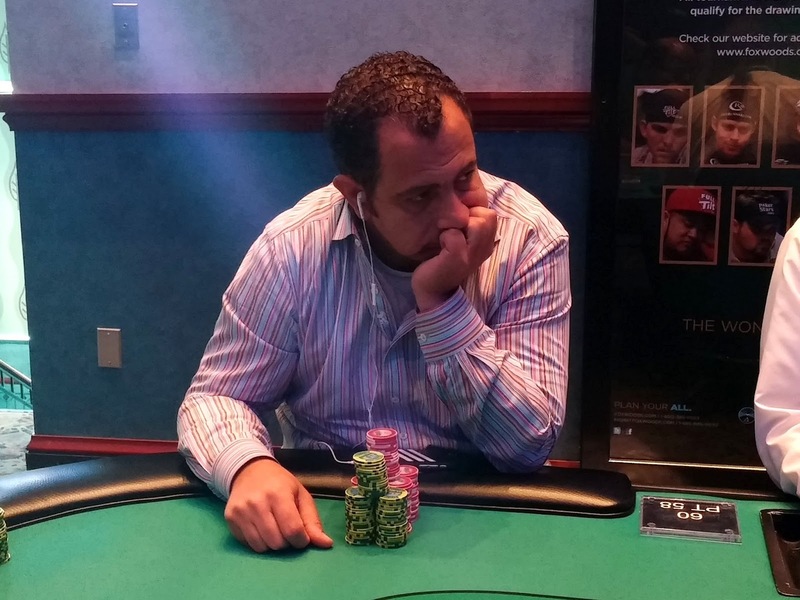 On a [7d][8d][Ac] flop, Rami Jradeh went all in with [Ts][9s] and Joseph Umdenstock made the call with [Ah][4s]. Rami wasted no time hitting his straight draw when the turn fell [6d], and Joseph was drawing dead. The meaningless [Ks] river meant Rami will double up to 3,800,000. On a J-3-4 flop, Daniel McCoy bet and Joseph Umdenstock made the call. The turn was a five, and Joseph moved all in. Daniel called all in for less, showing jack trey for two pair. But Joseph had gotten lucky with pocket fives, hitting a set on the turn. No jack came on the river to save Daniel's tournament life, and he will exit this tournament in 5th place, good for $33,350. On a [Td][9h][6d][Qh] board, David Cossio was all in holding [8h][6h] against Donald Lohr's [Ks][Qd]. David had a ton of outs with a flush draw, straight draw, and two pair draw, but the [Ts] river wasn't one of them. David will be eliminated in 6th place for $25,685. 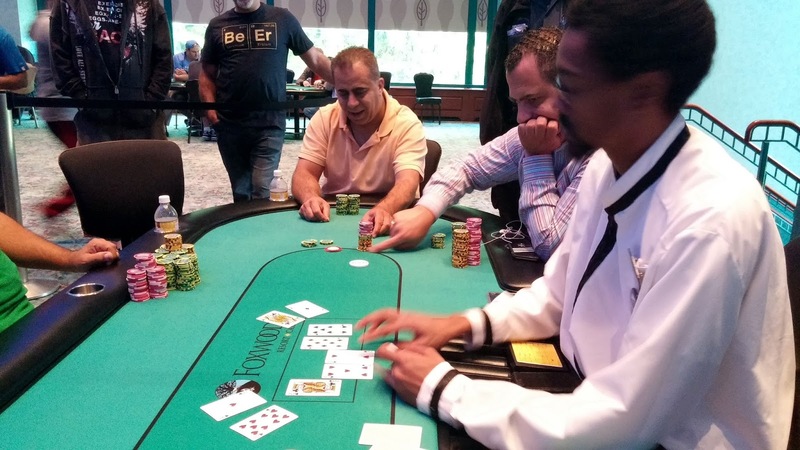 Eric Kitain was all in preflop holding [Qd][Qc] and was flipping with Firas Haddad's [Ac][Kh]. The [7h][5d][Kd] flop put Firas in front, and Eric would need to catch a queen to survive. 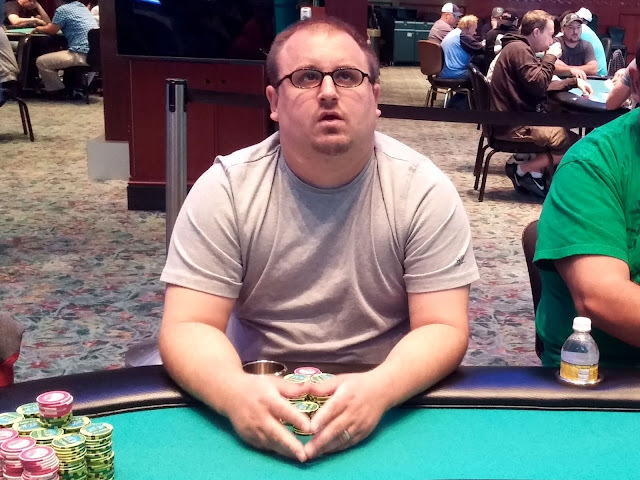 The [5h] turn and [8d] river meant that Eric will be our 7th place finisher, picking up $20,012 for his efforts. Aces was good enough to take the pot for Joseph, and he will send Irfan to the rail in 8th place, good for $15,771. 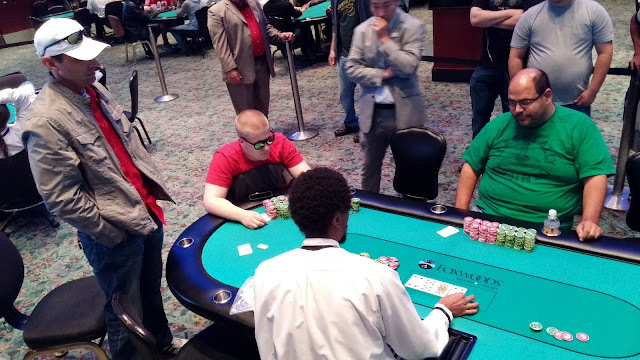 Jovy Ounthongdy was all in preflop holding [Qd][Js] and was up against the [Ah][8h] of Joseph Umdenstock. 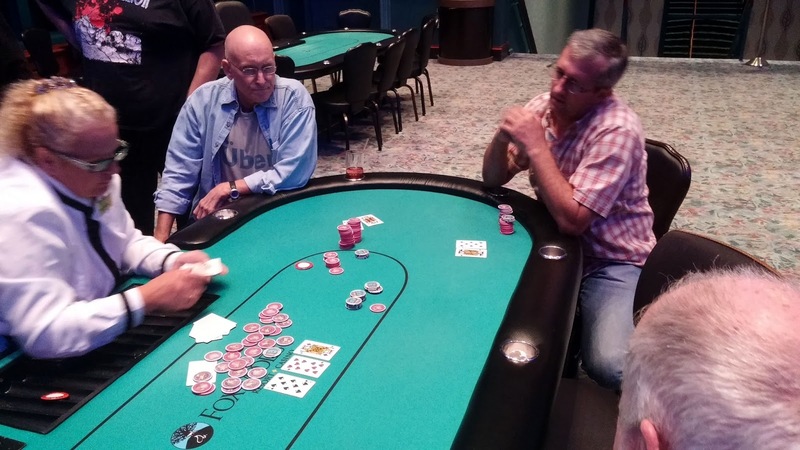 The [4d][Kc][9h] flop was no help for Jovy, and he couldn't catch up on the [6s] turn or blank river. Jovy will collect $12,574 for his 9th place finish. Day 2 levels will be 40 and 50 minutes. There is a dinner break after Level 25 (approximately 7:50pm). Day 2 levels will be 50 minutes. Levels 1-16 will be 30 minutes. Remaining levels on Day 1 will be 40 minutes. Day 2 levels will be 40 and 50 minutes, resuming at 1pm. There is a dinner break after Level 12 (approximately 7:20pm). The day will conclude at approximately 12:30am.